I’m not one to believe that my blog has any kind of market clout or impact, but I found myself scratching my head to explain why I got a comment on my “For Win8 Classic Shell Beats Start8, Hands-Down!” from one of the developers to point out to me that Start8 now also offers access to start menu features and functions the day after that posting. And indeed, it sure does. In fact, having now re-installed the new and improved version on my other Windows 8 full-time machine — my i7-2600K desktop machine — I find its behavior, customizability, and fidelity to the old Windows 2000, XP, and Vista/7 Start menus either as good or better than Classic Shell. Could my feedback have had anything to do with this change? Probably not, because there’s no way the developers could have written all the code necessary to make the substantial changes and additions to Start8 in one day. So, it has to be a colossal coincidence, but a tantalizing and amusing one, to be sure. 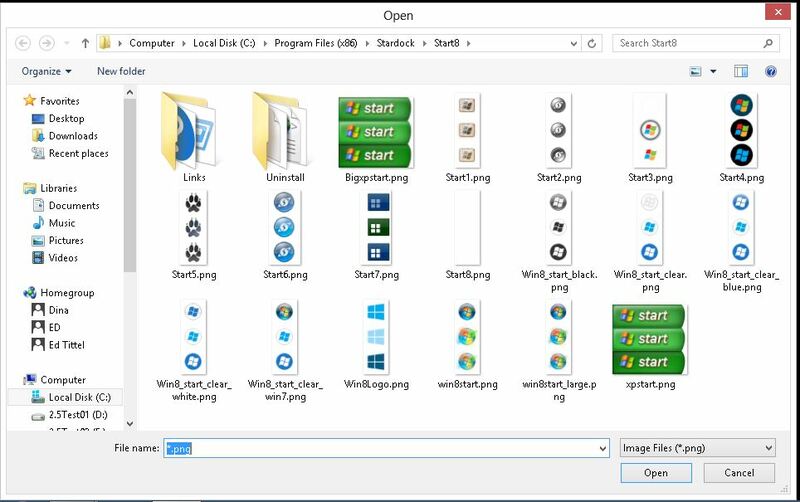 The basic Start menu looks almost exactly like the Windows 7 version now. 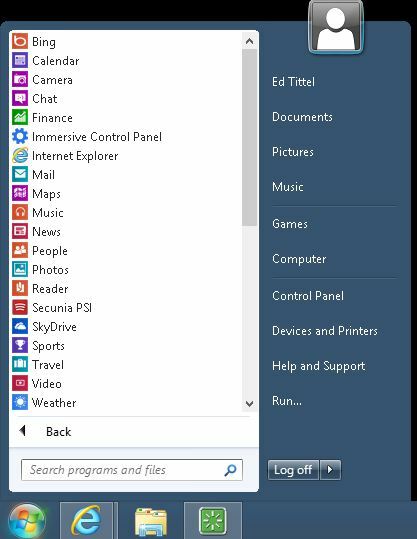 The Windows 8 Start screen tiles show up at the head of the “All Programs” list. Scroll down in All Programs, and thinks work the same as in Windows 7. The right-hand column menu entries work more like Windows 7 in Start 8, in fact, than they do in Classic Shell. The size and behavior of the Start menu area is nicely customizable, including a nice choice of Start button icons. For those who don’t want to use the Windows 7 style start button Start8 offers other choices. And if you don’t like the default icons that the developers supply, you can simply add your own to this folder to get the program to whichever way with icons you might like it to have. In the shot of the Task Bar that follows, I switched over to the Windows 8 logo sequence, as more consonant with a Windows 8 desktop. Check out the Windows 8 logo as the Start8 start button! For more information, including a complete features list and an animated demo of the new capabilities, or to download Start 8, head to http://www.stardock.com/products/start8/. 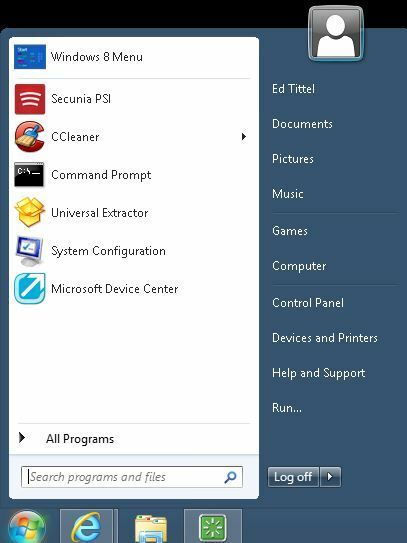 Start8 is okay but the usability, customization and skinning ability of Classic Shell's menu surpasses all of them.